This Ks signal shows Ks 1 (clear, expect clear). The white-black post plate tells the driver he may pass defective signal or when at stop without permission, in that case he must proceed on sight until the next signal. In the counter-direction the Ks signal serves a distant only (i.e. 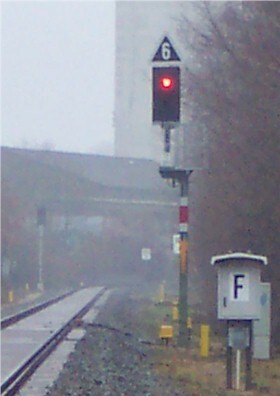 it cannot show stop nor clear, just expect clear or expect stop) as can be determined by it's distant signal post plate. Currently it shows aspect Ks 2 (expect stop). To the right there is an H-board for this line. At Berlin Zoo, there are some fine examples of Ks signals. 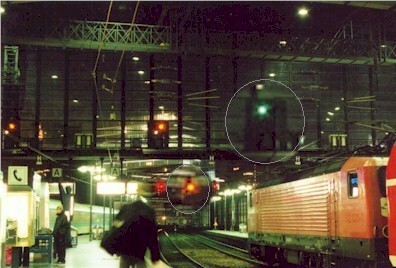 Above the loco, you see a green signal at Ks 1 (clear, expect clear) (enlarged). 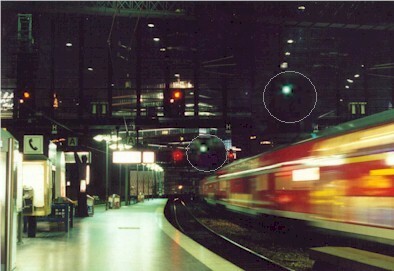 To the left, you see two amber signals at Ks 2 (clear, expect stop) that have a white marker light to the lower left of the main lantern, indicating these signals are distant signal repeaters. The repeater at Ks 1 has its white light turned off (since it is at clear). The next signal for the train, also enlarged, shows amber for Ks 2 (clear, expect stop). A few moments after the above shot: The train has just departed, and the signal that was previously at Ks 2 has changed to Ks 1 (clear, expect clear) since the next main signal also has changed to clear. 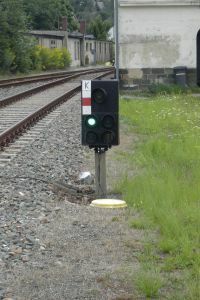 A Ks combined signal at Bad Segeberg. The upper post plate tells us it is an absolute main signal, and the yellow triangle means that it carries the distant signal information for the next main signal. The Zs 3 tells us we cannot go faster than 60 km/h. The "F" box contains the signal telephone. 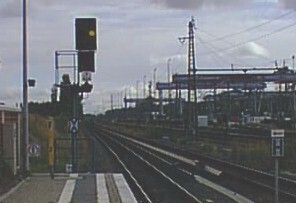 The corresponding distant signal at "expect stop". The white light, which is below the main light tells us that this is a repeater. Would the white light be higher than the main light, it would tell us that this is a distant which is closer than braking distance to its main signal. 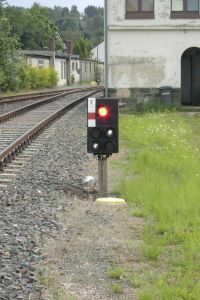 A Ks signal displaying a green light. Below the signal you see the white-red-white post plate (=main signal) and a yellow triangle plate (=Ks distant signal), so this is a combined signal, showing both home and distant aspects. It therefore displays the aspect Ks 1: clear, expect clear. 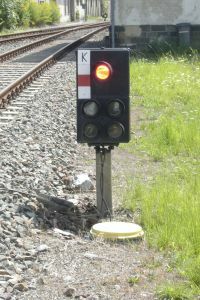 Another Ks signal displaying Ks 1. 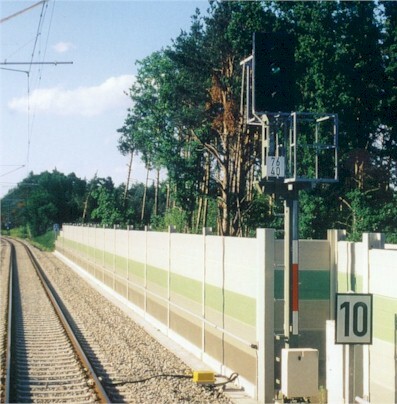 Since it does not carry a distant signal post plate but only a main signal plate, its meaning is "clear". 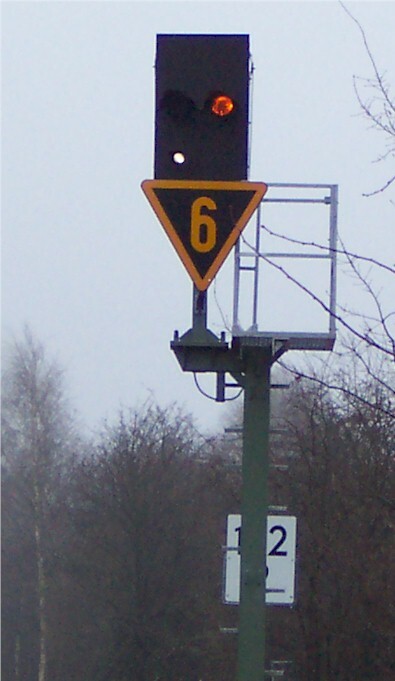 The board displaying the "10" is an Lf 7, a permanent speed restriction commencement signal, indicating that from this point on the speed limit is at 100 km/h. Another Ks combined signal at Ks 1: clear, expect clear. Note that the green light is flashing. The yellow "10" is a Zs 3v speed announcing indicator, so the overall meaning is: "Clear, expect clear with 100 km/h". 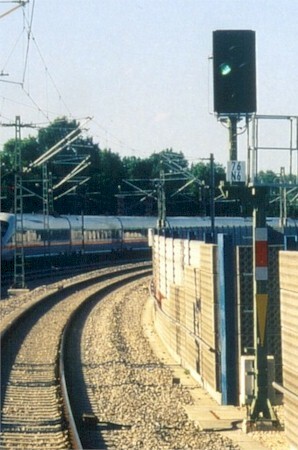 In the foreground you see two Ks distant signals (indicated by the distant signal post plate). The left one shows Ks 2: expect stop, the right one shows Ks 1: expect clear. The two yellow triangles are Lf 6 permanent speed restriction warning boards, announcing a permanent speed restriction of 100 km/h. (So the right distant is to be read as "expect clear with 100 km/h"). Whether the triangle points upwards or downwards is a matter of available space, the meaning is the same. 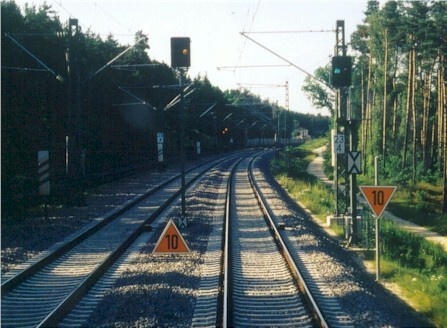 On the leftmost track you can spot three Ne 3 distant signal count-down markers, followed by an Hp distant signal (the two slanted yellow lights), displaying Vr 0: expect stop. 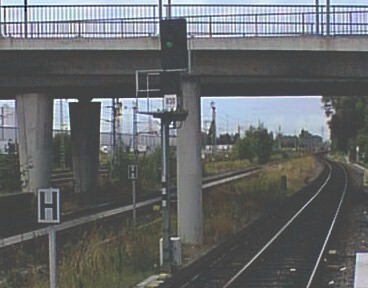 The signal now displays Hp 0 + Sh 1: stop for train movements, shunting movements may proceed.